A carnival is a type of blog event that is dedicated to a particular topic - in this case, art history. Carnivals appear in the form of a blog post, and they include links to the posts dedicated to that particular topic. Carnivals are like magazines: they are published on a regular schedule. This art history carnival is published on a monthly basis. This blog carnival is a great way for art historians (and those interested in art) to interact. This carnival also helps us to become familiar with the latest research/thoughts of others. Plus, it's a great way for bloggers to share their information (and blog!) with other people! Anyone can submit, providing that they have a blog and an art-related post to share! If you don't have a blog, you are welcome to submit the post of a friend. Please email your submissions to me directly (albertis.window@gmail.com). Your submissions should include the link(s) to the post(s) you are submitting - it is not necessary to include the text of the post(s) in the body of your email. I'm excited to read the submissions! Thanks for letting me host the carnival this month, Margaret. Please share the information about this carnival to anyone who might be interested in reading or contributing to it! And if you haven't written anything interesting for the carnival, don't despair: you still have about a week before submissions are due. 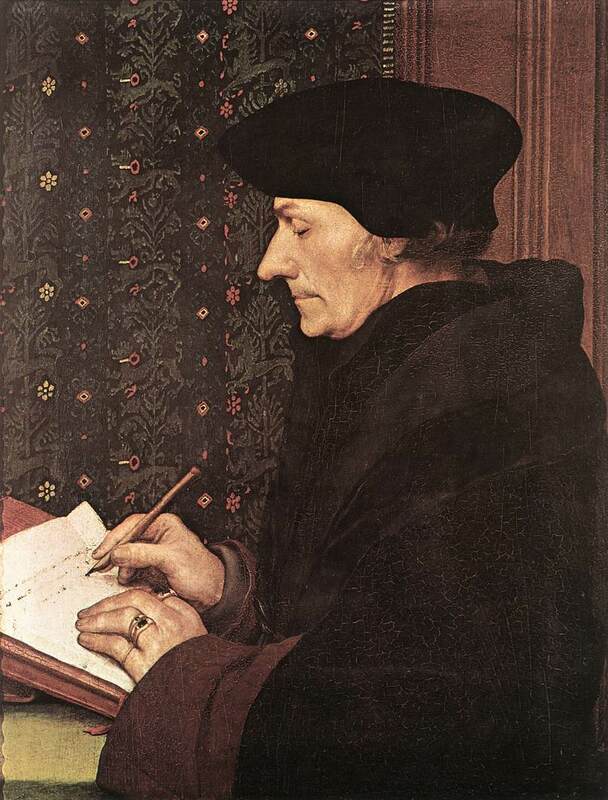 Sit down (like our friend Erasmus, who was depicted by Hans Holbein in 1523 (see above)) and start writing!